There is no better pairing in nature than volcanoes and hot springs and the Arenal Volcano in Costa Rica boasts numerous options to experience this super duo for yourself. What´s not to love about the impressive and beautiful Arenal, coupled with a relaxing soak in your choice of natural hot springs? Our Arenal Volcano and Hot Springs day trip from San Jose is a fan favorite, and we think you´ll agree! The Arenal Volcano and Hot Springs tour is not just about nature. As a bonus, on our way to Arenal from San Jose, we´ll make a quick stop in Sarchi. A town known as a hub of artistic activity and inspiration, Sarchi is home to the world´s largest oxcart. This oxcart in Costa Rica is the size of a small house and took over 70 days to complete! Before continuing to our final destination of the majestic Arenal Volcano, we´ll also stop in for a bite to eat at a local favorite restaurant with spectacular views of the valley. The Arenal Volcano was actually voted one of the top 7 Natural Wonders of Costa Rica a few years back, and for good reason! Arenal's perfect conical shape makes it a photographer´s dream, and the surrounding lush foliage ensures gorgeous views at every turn. Volcan Arenal has a storied past, with its big and surprising eruption in July of 1968 that resulted in the tragic loss of much of the surrounding wildlife. The constant low rumble for the subsequent 40 years makes the Arenal Volcano as much worthy of adoration as it is of respect. That giant eruption in 1968 even had such an impact on the people of the region, so humbled that in the grand scheme of things so many people were spared, that they even re-named the town of El Burio to La Fortuna, which translates to “the fortunate”. And fortunate they were! Things certainly could have gone a lot of different ways.....but let our guides tell you the full story. After the day´s journey and the nature hike around Arenal Volcano National Park, it´s time to seriously relax!! Which Arenal hot springs suits you best? 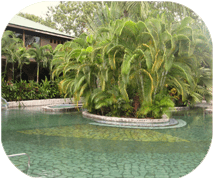 Choose from one of the famous Arenal hot springs resorts listed below. Your Calgon Moment awaits. One of the things that makes Baldi such a favorite is the sense of acceptance and inclusiveness. It´s a very fun atmosphere with lots of music and boisterous bathers. Baldi is also the only hot springs in the area with a family section, so if this excursion is a family affair, know that your kids will be welcomed with open arms. And you will welcome with open arms, the amazing dinner you´ll be served! Soaking up a gorgeous view of the mountain, enjoy a lovely dinner before we pack up and head back to San Jose. Departures: Daily at 8:00 AM from San Jose. *This tour require a minimum of 6 people, however if you have more than 6 this tour can operate any day of the week. Cash for tour balance, souvenirs and tips. Children: Minimum age is 3. Children 4-10 pay discounted child price, 11 and up pay full price. 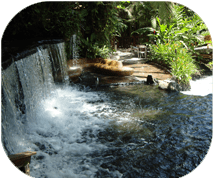 The famous and beautiful Tabacon Hot Springs is a once-in-a-lifetime experience. The setting is surreal, with its super green and exuberant foliage, winding paths to secret hidden pools, picture-perfect landscaping, fast waterslide and swim up bar, we guarantee you´ve never seen anything like it! Have a couple of drinks, relax your cares away, and after all that relaxation and fun, dinner will be a welcome treat. With the great volcano as your dinner companion, it´s sure to be a day to remember. Disclosure: Prices are subject to change for the holiday season and holy week. Please contact us during these dates to quote your tour. 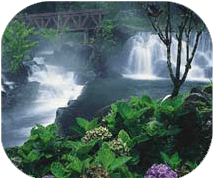 Arenal Volcano & Tabacon Grand Spa deposit is $35.00 per Adult and $25.00 per Child. Beautiful enough for television, The Springs hosted longtime reality show The Bachelor a few years back. So if you´re looking for a little star power with your toxin release, look no further! The grounds are of course perfectly manicured, with water features that give rise to the understanding of why this particular property was chosen for the show, and we´re confident you´ll find yourself oohing and aweing in the midst of all that maxing and relaxing. The Springs is also home to an animal preserve, which is a neat twist on the traditional hot springs experience. See ocelots, monkeys, macaws, and even a puma! All of this and dinner too, are waiting for you at The Springs. Arenal Volcano & The Springs Resort deposit is $35.00 per Adult and $25.00 per Child.